During the past year, private sector innovations, rather than government policy, dominated the interoperability discussion. One of the most interesting things about the list of this year's most read stories on the topic of interoperability is how few of them relate to policy or federal rulemaking. In years past when we've compiled similar articles, many of the news items would be about the data exchange implications of Stage 2 meaningful use, say, or initiatives from the Office of the National Coordinator for Health IT, such as the Shared Nationwide Interoperability Roadmap or the Interoperability Proving Ground. This year, many of the stories focus on innovations from the private sector, whether it's longstanding groups like HL7, startups like the Intermountain-backed Redox or giants such as Epic and Apple. In fact, there's nary an ONC story to be found on this list. Where the government does factor in – admittedly often – is in stories about the U.S. Department of Veterans Affairs and its choice of Cerner to replace its VistA electronic health record. That's a big deal, of course, with interoperability as a central concern. And it could have long-term implications for the wider evolution of data exchange. But the larger story told by this list seems to bear out what many stakeholders have been saying for a long time: Despite the value and well-meaning of policy guidance from Washington, if interoperability is truly going to gain traction it will have to happen from the ground up, driven by the private sector: vendors, health systems, standards groups, patients, VC investors and more. As the industry geared up for HIMSS17, Cerner President Zane Burke said his company is committed to an open philosophy to interoperability. "It's one thing to say it, it's another thing to do it," Burke said. "It takes significant focus to be both open and interoperable." "It's one thing to say it, it's another thing to do it. It takes significant focus to be both open and interoperable." And the company is putting its money where its mouth is, he said, earmarking much of the $700 million it spends for research and development on advancing the open approach and working with partners and enabling them to develop on top of Cerner software via APIs. Interoperability, said Burke, is "a moral obligation in our industry." 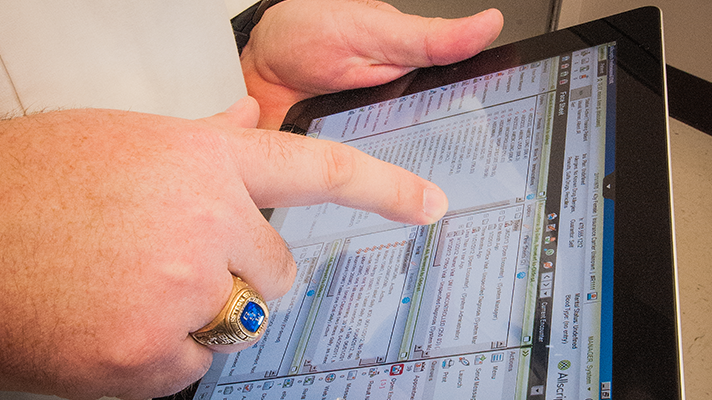 The U.S. Department of Veterans Affairs ultimately tapped Cerner to replace its VistA EHR in June, motivated largely by the promise of seamless data exchange with the Cerner technology being rolled by the Department of Defense. But before that decision had been announced, Chilmark Research founder John Moore suggested that a different approach would be better for the healthcare industry at large. "Choosing another vendor besides Cerner may actually force leading industry EHR vendors to truly address interoperability at a far deeper level than what has been done to date," he said. Earlier this month the VA laid out the functional requirements it expects of Cerner, and interoperability is top of mind for the agency. Along with requiring Cerner to provide a level of secure information exchange, VA stipulated that Cerner "is required to collaborate with VA affiliates, community partners, EHR providers, healthcare providers and vendors to advance seamless care throughout the healthcare provider market." "(Cerner) is required to collaborate with VA affiliates, community partners, EHR providers, healthcare providers and vendors to advance seamless care throughout the healthcare provider market." The aim is to have "a design architecture that allows for access to and sharing of common data and an enabling security framework that supports end-to-end healthcare related clinical and business operations." And here's that company again: At the 2017 Cerner Health Conference, the Kansas City-based vendor told more than 16,000 customers about two new interoperability projects. One is a new consumer-directed patient record: Cerner "will work in concert" with a given provider's patient portal so every patient "has the ability to take our information and create our own experience," said President Zane Burke, enabling health records to be shared together in one place, rather than separate providers running on separate systems. Burke also announced an extension of free CommonWell services to Cerner customers, for three more years through 2020. "It shouldn't matter if it's Cerner's EHR or someone else's EHR," said Burke. "We need data from multiple places, and we need that data to flow freely." Cerner's big rival, meanwhile, introduced its own data exchange tool, Share Everywhere, which enables patients to grant doctors and caregivers access to their data. A patient already using Epic's MyChart patient portal can tap into the Share Everywhere feature to generate a one-time access code that the patient would verbally tell the doctor, according to an Epic spokesperson. The clinician, in turn, would take that code to a Share Everywhere website and verify it against the patient's date of birth. "In addition to having a view of the patient's record, the doctor would be able to enter a progress note regarding the visit, which would be sent back to the patient's home provider," the spokesperson said. It was reported in June that Apple is is working with the Argonaut Project to integrate more electronic health data with the iPhone, a move experts say could go a long way towards advancing medical record interoperability. Participants in the Argonaut Project – an HL7-led initiative focused on expanding the use of open standards for health data exchange, notably HL7's FHIR specification – are some of the industry's most notable vendors and providers: Accenture, athenahealth, Cerner, Epic, McKesson, Meditech, Surescripts, The Advisory Board Company, Beth Israel Deaconess Medical Center, Boston Children's Hospital, Intermountain Healthcare, Mayo Clinic, Partners HealthCare. "There has been more and more effort and attention being paid to empowering patients with the ability to aggregate their own data, and then do more with it than they otherwise would have." Argonaut leader Micky Tripathi, president and CEO of Massachusetts eHealth Collaborative, seemed excited that Apple could play a significant role in improving interoperability – especially with regard to consumer-mediated exchange. "There has been more and more effort and attention being paid to empowering patients with the ability to aggregate their own data, and then do more with it than they otherwise would have," he said. "That's the idea, and the hope people have. There are many challenges to that, but we're making incremental progress on the way." While interoperability was a key driver in the VA's choice of Cerner for its EHR modernization, HL7 Chief Technology Officer Wayne Kubick said he hoped the decision wasn't based on interoperability alone. That's because the VA should be able to capitalize on FHIR with whatever platform the agency chose, he said. The HL7 standard for electronically exchanging health data is web-based and makes it easy for providers to receive targeted requested data. "So doing it for the sake of interoperability doesn't make sense. There are a lot of APIs that work for individual products." "So doing it for the sake of interoperability doesn't make sense," Kubick said. "There are a lot of APIs that work for individual products." Redox, a startup founded by three Epic System engineers in 2013, scored a $1 million add-on investment from the Intermountain Healthcare Innovation Fund, the commercialization arm of the Salt Lake City-based healthcare system, bringing the total for Redox's Series B funding to $10 million. The investment will be put to work on further developing and marketing its API interoperability platform used by software developers and healthcare organizations. "Redox is quickly becoming a standard in application interoperability," Vivek Reddy, chief health information officer at Intermountain Healthcare, said in a statement. "Their platform has evolved into the largest network of enterprise healthcare applications with the ability to scale innovations across large health systems like ours." One month after Allscripts announced in August that it would purchase McKesson's hospital IT business for $185 million, there were still many questions about just how the acquisition would affect the healthcare landscape. "If you're going to be truly open with the dev platform, you must allow insights to be delivered to the point of care." Justin Campbell of Boston-based consultancy Galen Healthcare Solutions, who has worked on integration and interfacing projects involving Allscripts, Cerner, Epic, Meditech and others, said he was intrigued especially about what the deal might mean for interoperability. "Allscripts really casts themselves as being open, and that's exhibited by 120-plus apps that are currently in their app store as part of their Allscripts Developer Program," Campbell said. "But if you're going to be truly open with the dev platform, you must allow insights to be delivered to the point of care, and insert extensibility into your applications to truly be interoperable, so you can facilitate innovation," he said. Once again in 2017, HL7's FHIR spec was a hot topic at HIMSS17. But while many vendors were touting their embrace of the interoperability spec, and while the promise it holds for enabling faster and easier exchange of data is very real, the open API isn't going to supplant existing HL7 standards such as Version 2 and CDA any time soon, said HL7 board member Russell Leftwich, MD, senior clinical advisor of interoperability at InterSystems. In a Q&A, Leftwich said that meant the healthcare industry will be taking a hybrid approach to interoperability standards for the foreseeable future.